In June it will be the 20th Anniversary of The Reading Agency's Summer Reading Challenge. The Summer Reading Challenge 2019 theme is Space Chase, an out-of-this-world adventure inspired by the 50th anniversary of the first moon landing. The Challenge will launch in libraries in England and Wales on Saturday 13 July 2019 and in Scotland on Saturday 22 June 2019. 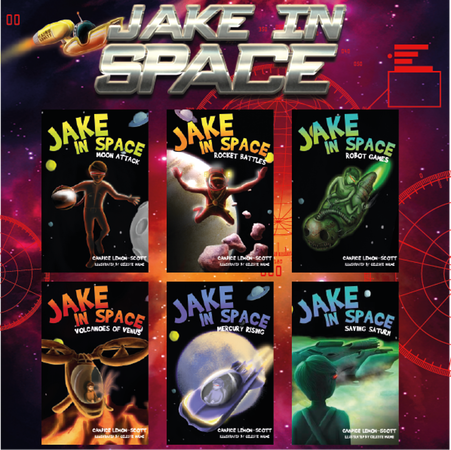 To inspire you about space and reading this Easter holiday, we are giving away 3 sets of all 6 books in the Jake in Space series by Candice Lemon-Scott! Which planet in our solar system (or beyond) would you like to visit and why? Entries must be in by Monday 6 May.